Galileo represents the beacon of modern Rome, a linking bridge between Science City and Eternal City. The main idea is to provide through the complex important and diversified functions, ensuring the complete operation of the system, embodied by a prominent vertical developing building. A) the VERTICAL DIMENSION, identified in the Tower called GALILEO, where residential and tourist accommodation function and an appendix of the museum space, took place. 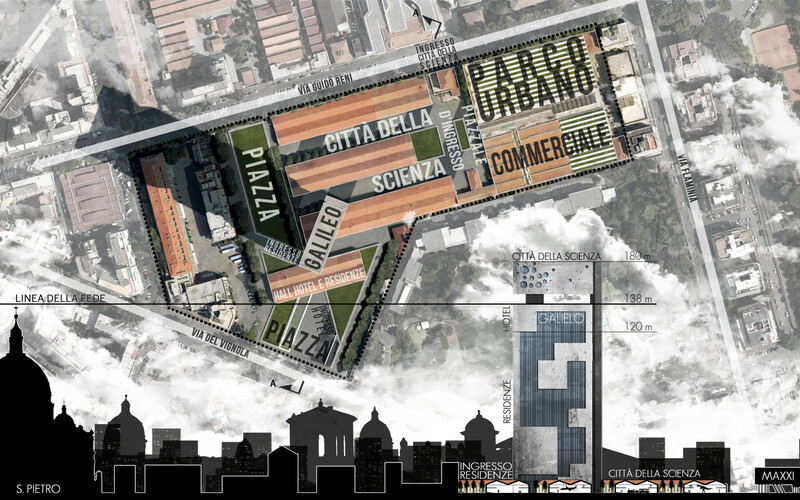 B ) the HORIZONTAL DIMENSION, identified in the design of the public spaces, where the SCIENCE CITY MUSEUM occupies the collection of existing buildings that need to be redeveloped. The tower aims to become a contrasting element compared to conventional development of the city, also using the breaking behaviour that science has been able to take. The vertical growing is adopted as a sustainable solution, differing from the trend of expansion of the city towards increasingly blurred boundaries. At the same time, using already built areas with no useful features, enforces the articulation and stratification that characterizes the City. The typological choice, in addition to being an act of responsibility for urban transformation, introduces new features in an unconventional use of land. For this reason, the building is designed as an archictural landmark sited in this portion of urban fabric. 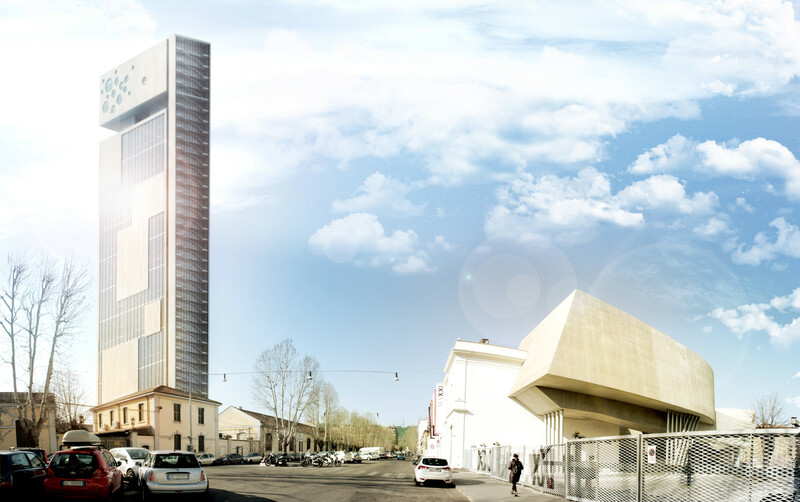 With its 180 m high, Galileo aims to join the cultural debate on vertical development, in a city where this issue was only declined as belonging to more than 400 years to the dome of St. Peter (138m). The thirty-third floor (138 m high) of the tower is totally empty, used as a large rooftop terrace, offering a new point of observation of Rome, strongly enforcing the connection and communication between the building and the whole city. The new construction provides 29,000 square meters of housing, 6,000 square meters of social housing, 5,000 square meters of tourist accommodation functions and, in the higher block, a multi-purpose exhibition hall of the museum below. – preserve the pre-existing urban aspect perception, catching the new constructed system only looking up. In fact, even in the inner spaces of he complex, the operations envisaged by the project are: the reuse of existing buildings with the addition of 27,000 square meters of Science City; the placement of commercial facilities to 5,000 square meters on the square; the construction of underground parking lot. Even the close planned underground, is taken as an opportunity. If it is true, as stated by A. Einstein that “science without religion is lame and religion without science is blind.” then these two not only can not exist without each other, but they well represents the rational and irrational sides in human being. The project wants to highlight this balance, that always characterized the eternal city, placing science on the same level of religion . VITTORIO MINIO PALUELLO, FABRIZIO BATTISTI e TA.R.I Architects. with: Luca Gaetano Malvasi, Matteo Tanzilli, Marco Tarquini.